In the last decade, New York City developed food policies designed to improve access to healthy food, reduce food insecurity, support community development, promote sustainable food systems, and improve conditions for food workers. Since 2012, the New York City Council has mandated the Mayor’s Office to prepare annual Food Metrics Reports to present data on selected food system indicators. 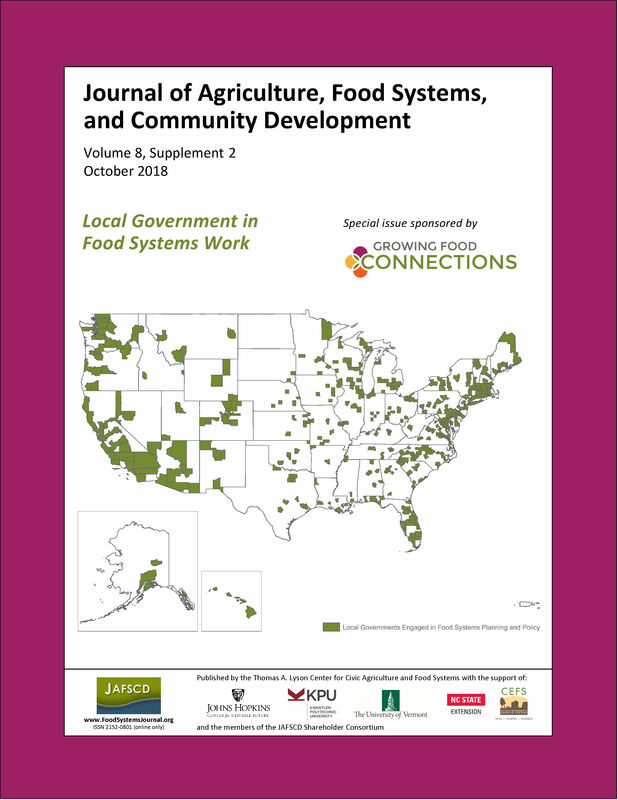 This article uses these reports to assess how the metrics describe the city’s progress in implementing municipal food policies set in the last decade. Our analysis examines: (1) changes in the indicators that the city reports; (2) strengths and weaknesses of the Food Metrics Reports as a tool for monitoring policy enactment and impact; and (3) opportunities for improvements to the indica­tors and the development and implementation of future metrics. We found that the reports show improvements in 51% of the 37 indicators and sub-indicators, declines in 40% and no change or no assessment in the remaining indicators. While the food metrics process has provided valuable data on the implementation of selected city food policies, it has several limitations. By adding new indicators, tapping into additional data sources, and engaging additional constituencies in the process, New York City food metrics could play a more useful role in helping New York City to set goals and monitor progress towards the development of a more equitable, efficient, and sustainable munici­pal food system. The experience with food metrics in New York City suggests lessons for the use of food policy monitoring to improve food systems in other cities. The copyright to all content published in JAFSCD belongs to the author(s). It is licensed as CC BY 4.0. This license determines how you may reprint, copy, distribute, or otherwise share JAFSCD content. The mission of the Center for Regional Food Studies at the University of Arizona is to integrate social, behavioral, and life sciences into interdisciplinary studies and community dialogue regarding change in regional food systems. We involve students and faculty in the design, implementation, and evaluation of pilot interventions and participatory community-based research in the Arizona-Sonora borderlands foodshed surrounding Tucson, a UNESCO-designated City of Gastronomy, in a manner that can be replicated, scaled up, and applied to other regions globally. In this talk, Carlton Turner will use the work of Sipp Culture as a framework for how rural communities are grappling with reimagining their cultural identity in the wake of systems consolidation (in educational, medical, and food systems) and expansion of the digital divide across race and class lines. Carlton Turner works across the country as a performing artist, arts advocate, policy shaper, lecturer, consultant, and facilitator. He is the founder of the Mississippi Center for Cultural Production (Sipp Culture), which uses arts and agriculture to support rural community, cultural, and economic development in his hometown of Utica, Mississippi. Why are we a shareholder of JAFSCD? It’s simple. The Center for Environmental Farming Systems and NC State Extension share the same goals as JAFSCD in promoting research-based strategies that simultaneously minimize food insecurity and farm loss and maximize community resilience.